Romano's Restaurant & Art Gallery is pleased to announce Tony Romano's latest series of hand- painted signed and numbered, Italian glass bottles of homemade limoncello. Limoncello is traditionally served after dinner or with the dessert course. One sips limoncello slowly, not all at one time as a shot. This liqueur is delicious when paired with desserts from the Romano's menu such as Italian Court, Poached Pear in Chardonnay, or Chocolate Gateau. Limoncello may also be served drizzled over ice cream. According to Mr. Romano, "The homemade limoncello far surpasses any commercial product I've ever tasted. 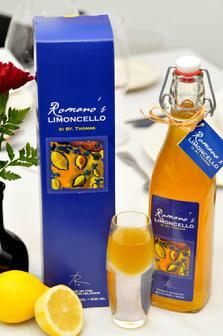 If you want the true limoncello flavor that you would experience on the Amalfi Coast in Italy, you have to make it yourself, which is exactly what we do at Romano's." Please stop by for a FREE Limoncello tasting! His studio is located on Middle Road in Nazareth, third house on the left. Just one minute drive from the Ritz-Carlton Hotel or Red Hook.